Romelu Lukaku opened the scoring for Belgium. 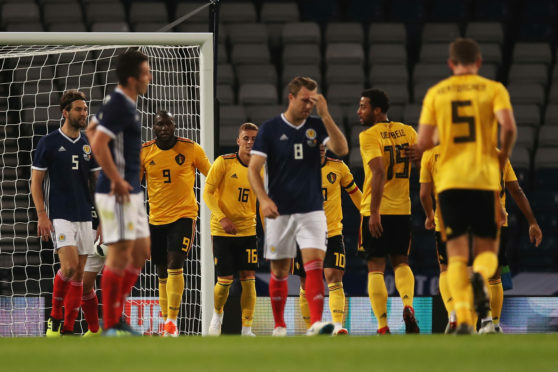 Scotland suffered their heaviest home defeat in 45 years with a masterclass from Belgium inflicting a 4-0 defeat on Alex McLeish’s side. Romelu Lukaku, Eden Hazard and Michy Batshuayi (two) all found the net on a chastening night for the Scots, who were given the runaround by Roberto Martinez’s men for large swathes of the game at Hampden Park. The boisterous away support watched their team stroll to victory, with Hazard in particularly imperious form. Scotland contributed to their own downfall, with arguably three of the four goals coming from mistakes made by those in blue. The caveat for McLeish will be the quality of opposition Scotland were up against but he will not be happy with the ease in which opportunities were gifted to the Belgians. McLeish started with a back three, handing John Souttar his debut, with Kevin McDonald partnering John McGinn and Stuart Armstrong in midfield. Craig Gordon got the nod over Allan McGregor in goal and former Aberdeen midfielder Ryan Fraser, now with Bournemouth, started as a wing-back. The World Cup semi-finalists named close to a full-strength side, ahead of their Uefa Nations League opener against Iceland on Tuesday. Eden Hazard skippered a side including Thibaut Courtois, Vincent Kompany, Dries Mertens and Romelu Lukaku. Eden Hazard was the source of Scotland’s early problems, winning a free-kick from John McGinn that Mertens bent through the wall but into Gordon’s grasp, and teeing up brother Thorgan for an early sighter that drifted wide. Scotland spent much of the first period camped close to their own penalty area, regularly manned up against five yellow jerseys as Roberto Martinez’s took advantage of the deep defensive line to push extra bodies forward. Patience and discipline was a necessity for the home side and in Armstrong and McGinn, they had midfielders who built counter-attacks. Both had impressive starts but McGinn was caught out for the opener on 28 minutes, although some blame could be attributed to Gordon. The Celtic stopper took a harmless floated ball and bowled it quickly to McGinn, who was rounded on quickly by Mousa Dembele. Thorgan Hazard was in space and rolled it on a plate to Lukaku, who took his time before finishing. McGinn was looking to make amends and arguably had Scotland’s best chance of the opening 45 after a one-two with Fraser, angling a shot that Courtois was able to collect at his near post. Kompany clipped the bar from an Eden Hazard corner shortly before the interval in a comfortable half for the visitors. Courtois’ work was little more than routine and McLeish’s side offered little in the way of inspiration for an underwhelming Hampden crowd. The second half was 51 seconds old when Eden Hazard superbly doubled Belgium’s advantage, shimmying past Fraser and lashing into the top corner, underscoring his masterful performance. A hiding was on the cards when Batshuayi made it three on 52 minutes, with Mulgrew’s stray ball this time contributing to the goal. Dembele picked off his pass with ease and fed Hazard, who spotted Batshuayi peeling off into space and he rolled the ball under Gordon. The mistakes were piling up and it was Ryan Jack’s turn on the hour to suffer as Youri Tielemans caught him dwelling in possession and found Batshuayi, who beat Gordon well from the edge of the box. Opportunities for a consolation were scarce. Courtois foiled Steven Naismith from close range just after the hour but Belgium continued to press forward at pace, with Batshuayi finding the side netting while chasing a hat-trick. Dons captain Graeme Shinnie was a second-half substitute and Fraser teased a fine stop from Courtois with six minutes to go, but Scotland were unable to get off the mark on a difficult night in Glasgow.